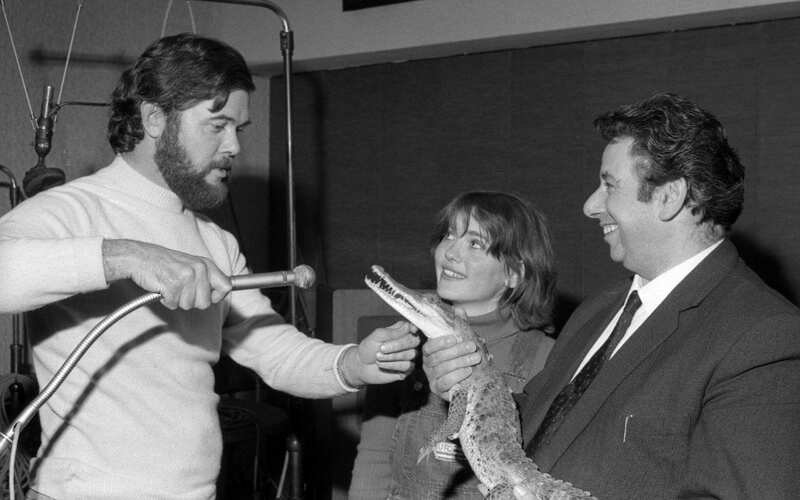 Who presented the first British chart show on the radio? 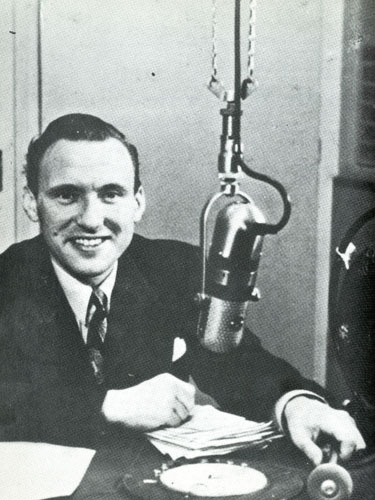 Before you all shout out Alan Freeman or David Jacobs, I'm talking about the late 1940s and a certain DJ on Radio Luxembourg. 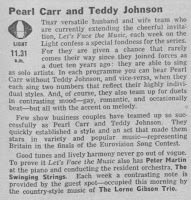 Teddy Johnson is perhaps best remembered - for those with long enough memories - as the one half of the husband and wife singing duo ' Pearl Carr and Teddy Johnson'. 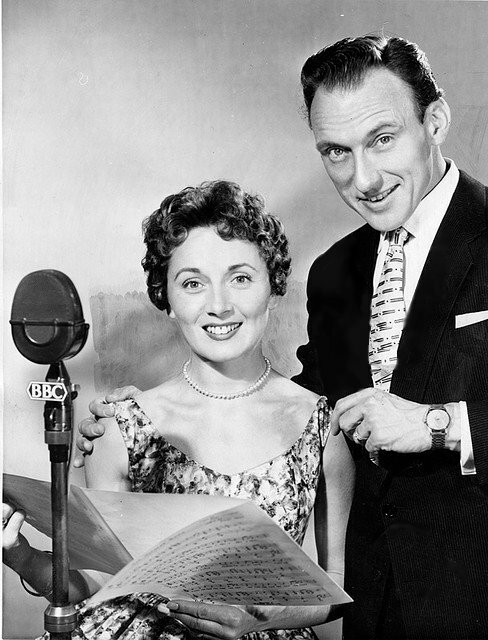 At the height of their fame in the 1950s they made regular appearances on TV and radio and, in 1959, represented the UK in the Eurovision Song Contest with that annoyingly catchy little ditty, Sing Little Birdie. By the time Teddy made his first UK broadcast in 1944, singing with Jack Payne and his Orchestra, he'd already been performing for ten years as a drummer and vocalist with assorted dance bands. After the war he decided to go freelance and chance his arm as a singer/comedian. 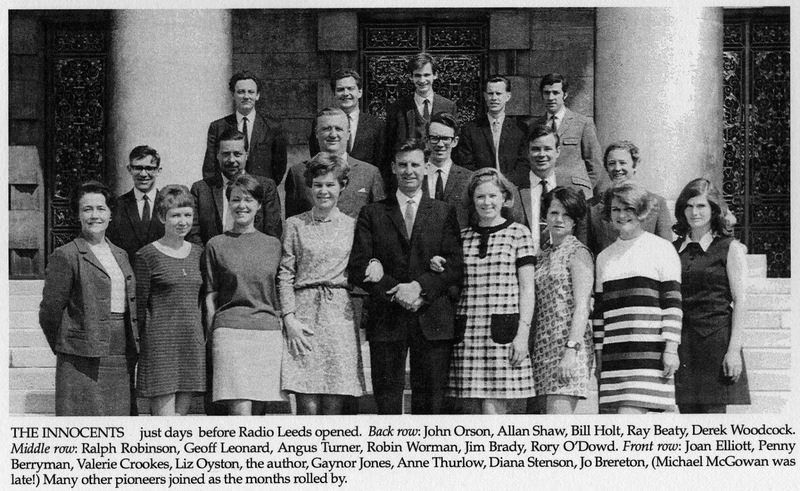 On the recommendation of a friend it was suggested he contact Frank Lee, at the time Head of the English Service of Radio Luxembourg at their London offices in Davis Street. 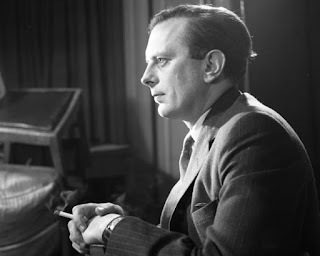 Teddy was told to report to the IBC studios for a voice test and that same afternoon received a phone call asking if he'd like to take a trip over to the Grand Duchy and have a try-out. He was on-air the following weekend, playing mostly Geraldo records alongside station boss Geoffrey Everitt. 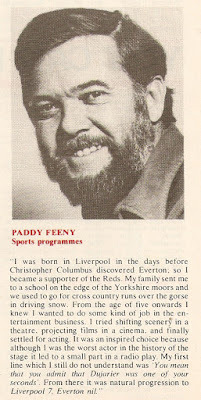 He was immediately given a full-time job - starting on 20 May 1948 - broadcasting each night of the week, apart from Friday, and on Sunday afternoons with Everitt. 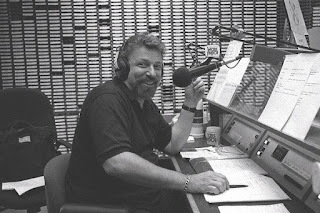 The scarcity of announcers at the post-war station (aside from the pre-recorded programmes shipped over from London) meant that Teddy was forced to appear under more than one name; an approach also adopted by Pete Murray (one wonders if listeners were really fooled by this) at a time when the station's schedule was packed with 15 or 30 minute shows. 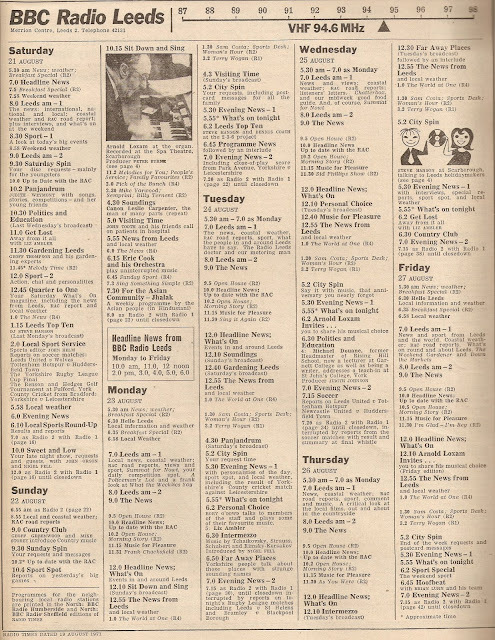 So his first programmes might be something like Topical Half Hour introduced by Teddy Johnson followed by the famous Luxembourg gong and then back on Music for Everyone with E. Victor Johnson and later Irish Half Hour with Edward V Johnson. 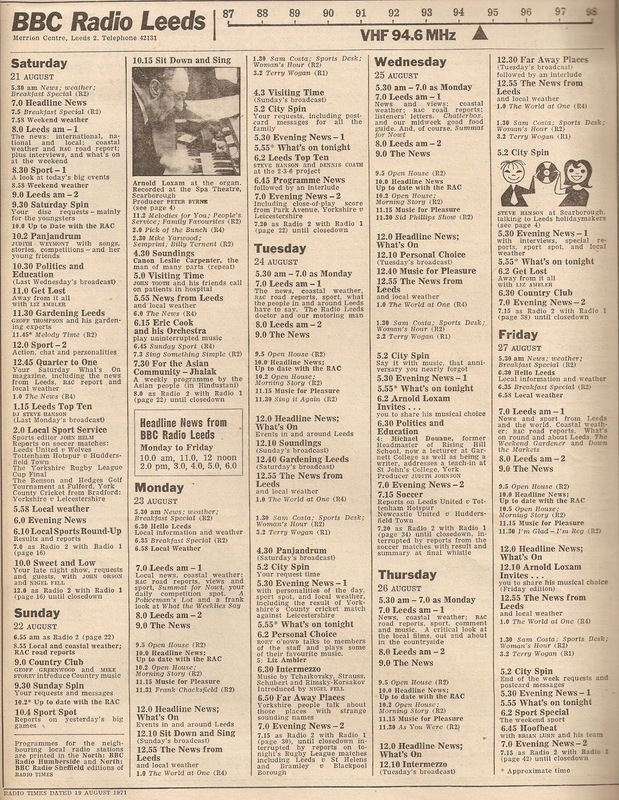 Around late 1948 or early 1949, no-one is exactly sure when, Geoffrey Everitt came up with the idea of a weekly Sunday night programme playing music based on the sales of sheet music. The rundown was in reverse order, from twenty to one. As it was likely that the same song could've been recorded by more than one artist they had alternative versions to play. 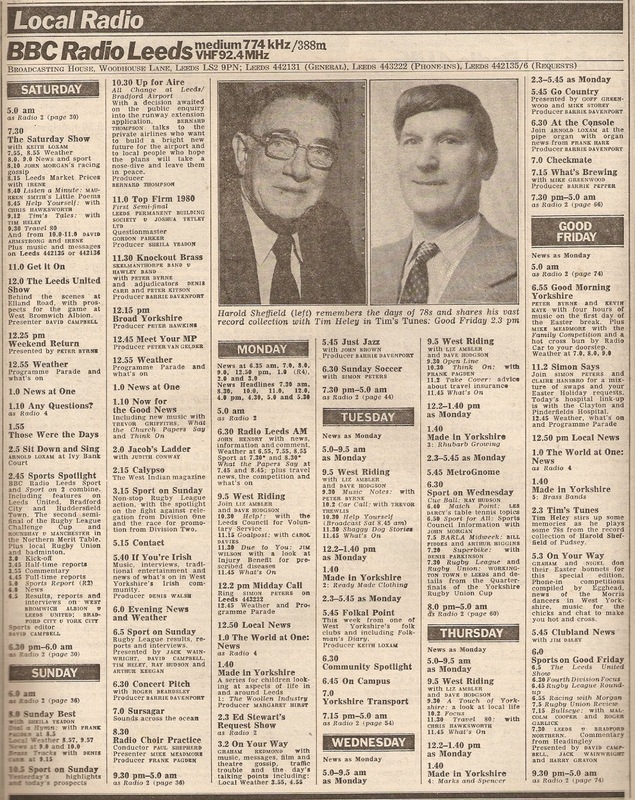 These early shows established a format that exists to this day, one picked up by the BBC, as Pick of the Pops in 1955. Teddy's stay at Luxembourg was brief, he left the station in 1950 as he was itching to get back to singing, releasing records such as Beloved Be Faithful and Tennessee Waltz. As a performer he regularly appeared on BBC radio in the early 50s on shows such as Stanley Black's Black Magic singing alongside Pearl Carr - they met for the first time whilst recording this show and married in 1955 - and Diana Coupland (long before her Bless This House days). He was back DJ-ing in 1951 on Housewives' Choice. The whole show had to be scripted and Teddy worked on it to ensure that it maintained the conversational style he'd adopted in the Grand Duchy. However, part-way through the week was out he was summoned into a meeting in which his script was excised of "everything in them which was me." After his Saturday show he was told that they hadn't liked what he'd done. It was eleven years before he was back in Broadcasting House. Despite the lack of faith from Anna Instone, the head of the Gramophone Department, Teddy continued to broadcast as a band singer for both the Home Service and Light Programme on Sweet Music, Melody from the Stars, Variety Bandbox, Showtime, Variety Matinee and Worker's Playtime. 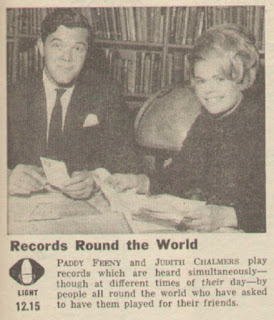 The diary was also filling up with TV appearances; Teddy's first programme for the BBC was in 1953 - again singing with Pearl - and they were both regulars on Crackerjack (1957-60), The Ted Ray Show (1958-59). 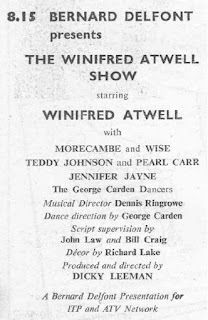 Over on the new commercial channel Teddy and Pearl appeared with the ivory-tinkling Winifred Atwell (1956) and later on The Arthur Haynes Show (1960) whilst Teddy was the host of ATV's Music Shop (1958-60). 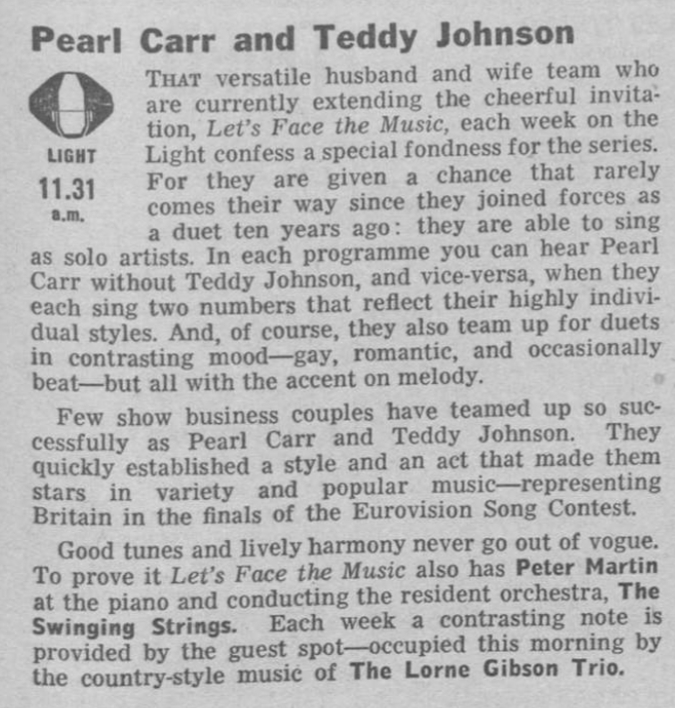 That Eurovision hit Sing Little Birdie came in March 1959 after an exuberant performance at the contest in Cannes secured them a second place. 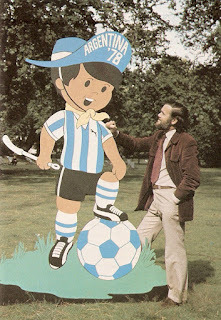 They were also in the running the following year when they took part in the heats but in the event it was Teddy's brother Bryan who represented the UK with Looking High, High, High - it also came second. Even though Teddy was no longer on the staff at Radio Luxembourg he continued to record programmes for the station: Tune Into Teddy, The Winifred Atwell Show and Meet Mr and Mrs Music in the mid-50s and appearing with Pearl in the 60s on The Postal Bingo Show. Meanwhile by 1962 he was back in favour with the BBC with another stint on Housewives' Choice, regular guest appearances (with Pearl) on Benny Hill Time and Harry Worth as well as their own star vehicle Let's Face the Music. 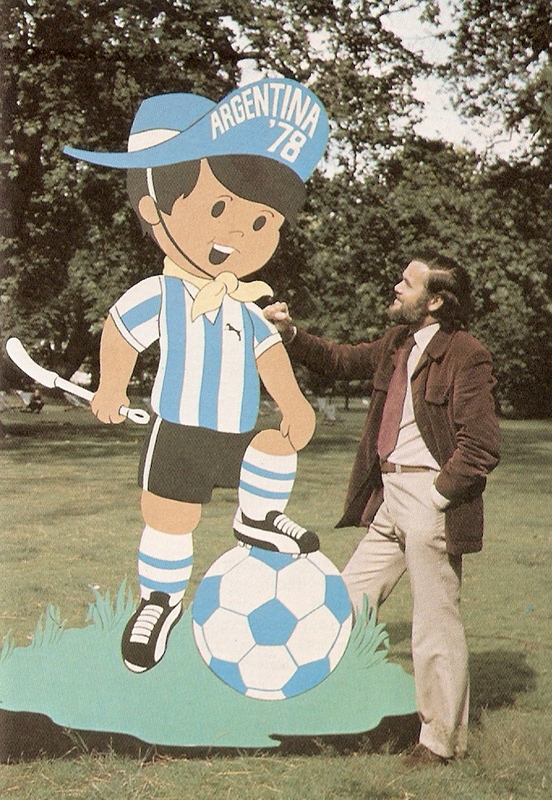 Teddy also had acting roles in a number of series penned by the Scottish thriller writer Edward Boyd. Steve Gardner Investigates, the story of a singer turned private eye was heard only by listeners to the Scottish Home Service in the 1950s but later series were broadcast nationwide on the Home Service and then Radio 4: The Candle of Darkness (1967), Enough Fingers to Make a Hand (1968) and The Wolf Far Hence (1971). The Candle of Darkness is being repeated on BBC Radio 4 Extra this week. 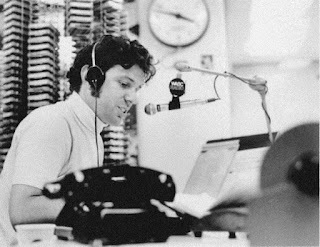 By the early 1970s Teddy was a regular in The Ken Dodd Show and, for eighteen months from October 1972, became the afternoon DJ on BBC Radio 2. Even when that stint finished in March 1974 he presented plenty of other programmes for the station: The Song Stylists (1973-4) and The Vocal Touch (1974), both written by former record producer Ken Barnes, The All-Time Hit Parade (1975-6) with singers Rosemary Squires and Nick Curtis and introducing the big bad sounds of Syd Lawrence and his Orchestra (1976). 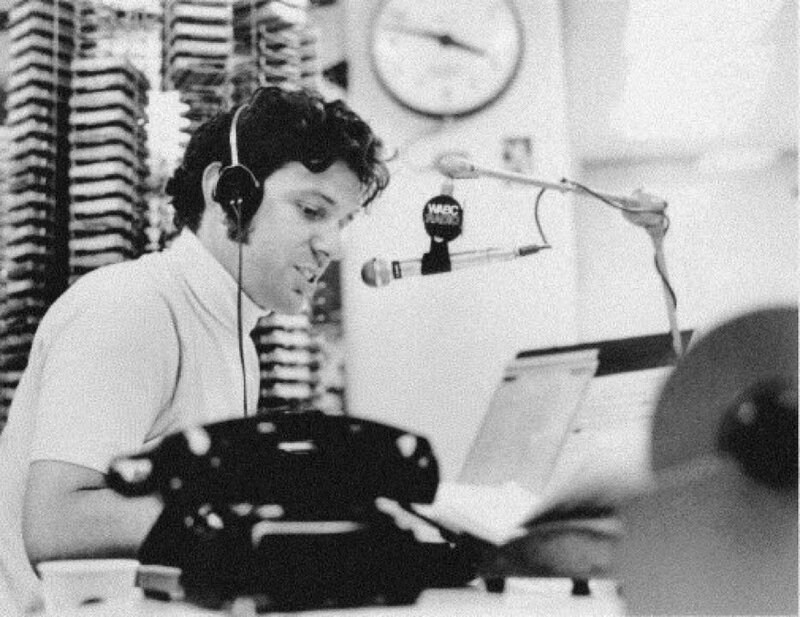 He was back spinning the discs and reading the dedications on a Saturday mid-morning show between October and December 1977. 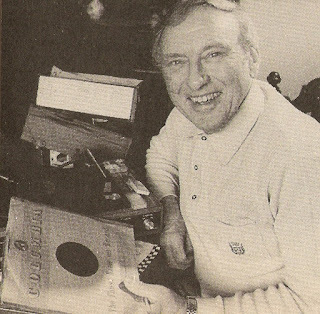 During the 1980s and early 1990s Teddy's radio appearances were mainly deputising for holidaying DJs: David Jacobs, Ken Bruce, Desmond Carrington and Alan Dell, though there were two music nostalgia series, The Music Goes Round and Round at 78rpm (1987) and Teddy Johnson's 78 Show (1988). 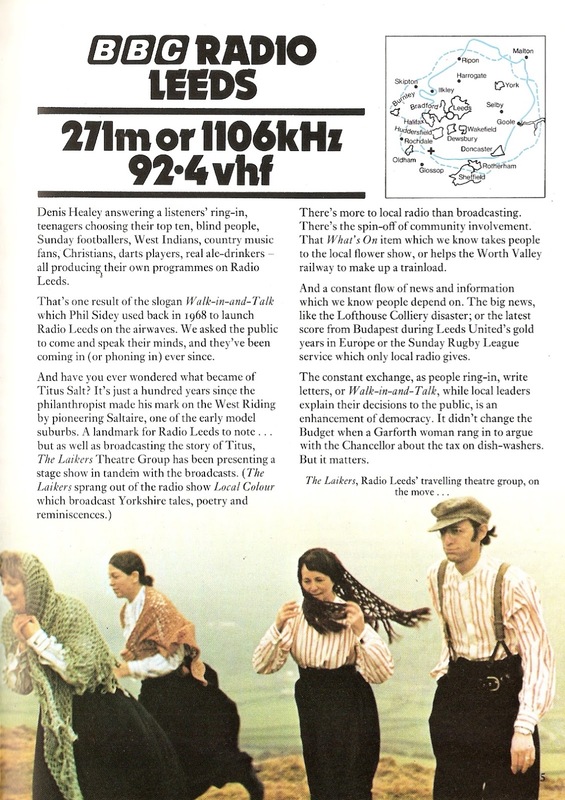 Teddy's broadcasting voice was warm and relaxed as evidenced by this clip from Radio 2's Sunday afternoon show Sounds Easy from 1992. 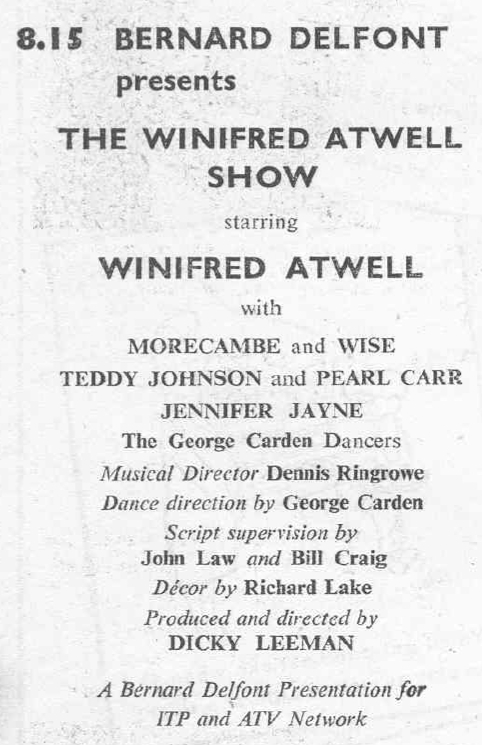 Even when Teddy's recording career dried up in the early 1960s, his light crooning style was out of fashion, both he and Pearl continued performing in variety, panto and musicals until well into the 1980s. Teddy was last heard on the radio in 2011 as a guest of Desmond Carrington in his series Icons of the 50s. Here are extracts of those interviews. In 2016 David Lloyd spoke to Teddy (and Pearl) - audio posted here on Audioboom. Teddy and Pearl lived out their latter years at Brinsworth House, the retirement home run by the Royal Variety Charity. Teddy's death was announced this week. 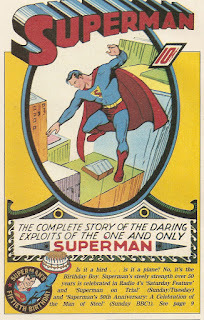 June 1938 and Action Comics publishes the first ever Superman cartoon strip. 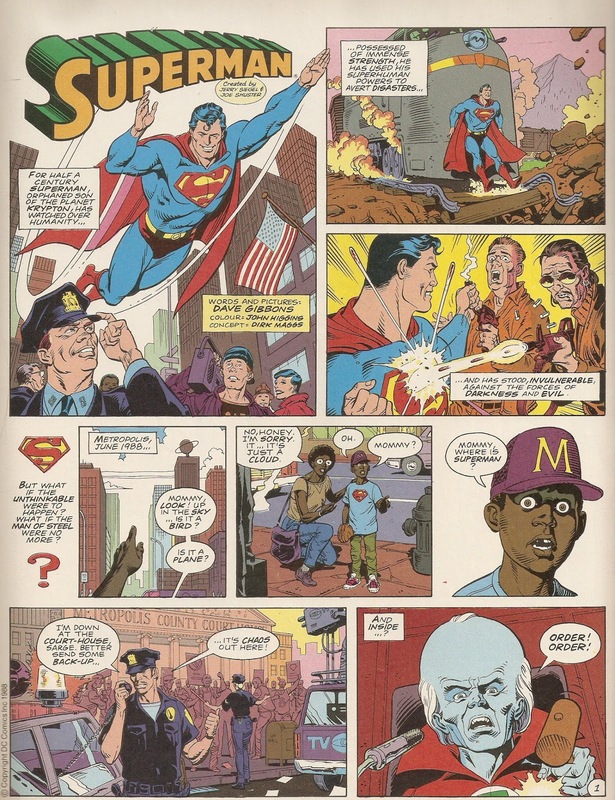 June 1988 and Superman stands on trail accused of crimes against humanity. 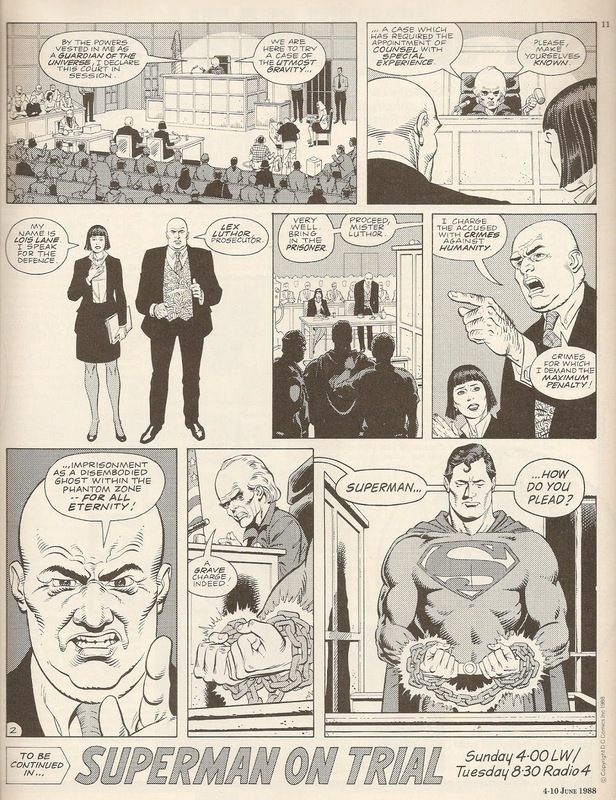 Prosecuting is his arch nemesis Lex Luthor. 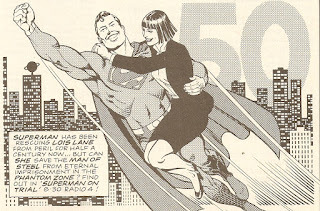 Defending the super hero is one Lois Lane. 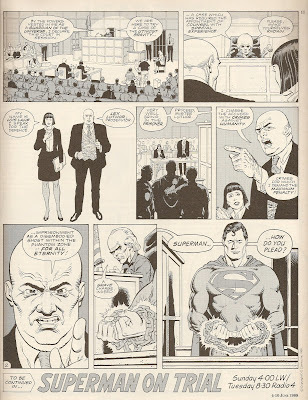 Witnesses from the comic world and the real world are called into court including the late Adam West. 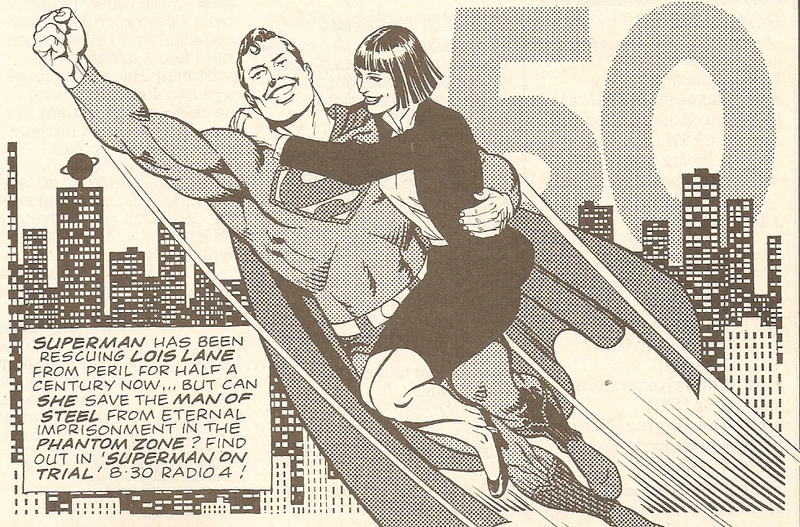 This was the premise of the Radio 4 drama documentary Superman on Trial that aired thirty years ago to mark the golden anniversary of the man of steel. Written and directed by Dirk Maggs it was first broadcast in a 45 minute slot but was eventually extended and remixed for a 2010 CD release. 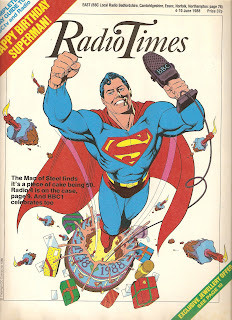 Superman garnered a Radio Times cover, though there was a BBC1 documentary that week too, together with some specially commissioned artwork, shown below. 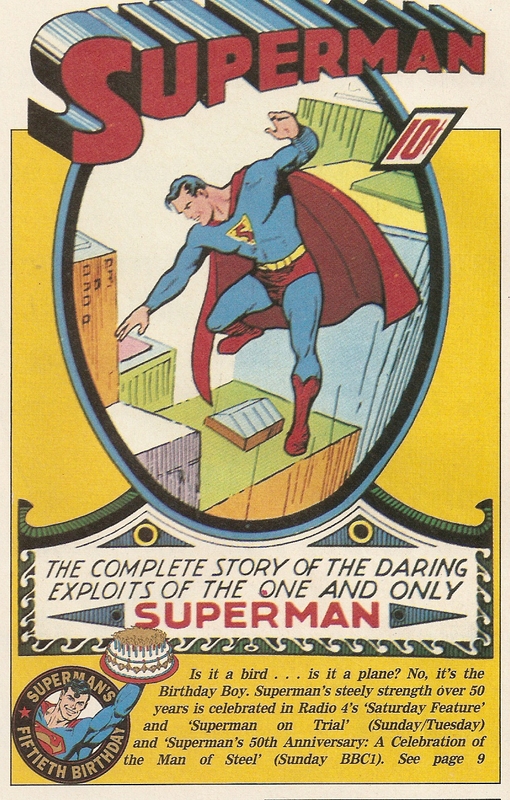 Superman on Trial hasn't been repeated since its 1988 broadcasts. 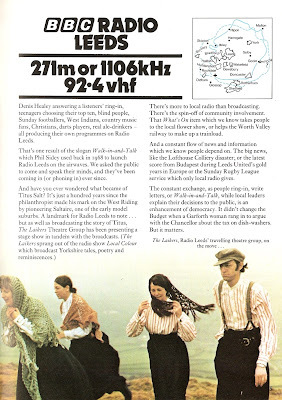 First heard on long wave only on 5 June my recording is of the Tuesday 7 June FM evening transmission. It was given another repeat on Christmas Day 1988. The success of the programme spurred the BBC to commission Dirk Maggs to write a full-blown adventure series in 1990 (5 episodes) and in 1991 (10 episodes). 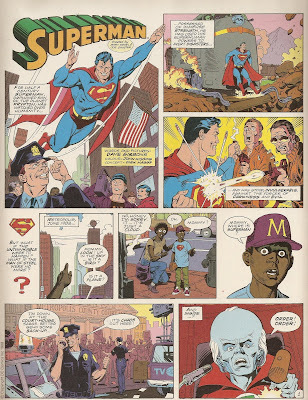 Over to station WGBS from Galaxy Communications in Metropolis.